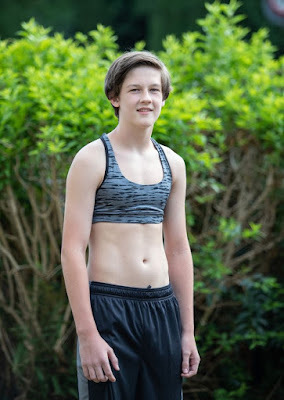 A schoolboy claims he was sent home from school for wearing a bra as part of a protest against a teacher's treatment of a female classmate. Raymond Deane, 15, decided to wear the garment to Hugh Baird 14-16 College in Liverpool to stick up for a female classmate, says his mum Kim. The Merseyside mum-of-two said her son was "angry and upset", when he came home from school after a teacher had disciplined and sent home a girl for wearing a sports bra, reports the Liverpool Echo . She said: "Raymond thought that the girl should have been taken to one side and spoken to rather than disciplined in front of everyone. "He was upset because he thinks it is body shaming girls who are already insecure." Kim said, unbeknown to her, her son came home and asked his sister and her friends for sports bras to wear at school the following day. And the following day he and three friends arrived at the school wearing their sports bras in solidarity. However, the mum claims the four pupils were put into isolation and told to either take off the sports bras and go back to class or risk being sent home. The 36-year-old said: "His friends took them off and went back to class, but he didn't and was sent home. He said the girl kept walking past the isolation room and smiling. "He said if he had taken it off there would have been no point to the stand he was making." Kim said her son, who previously attended The Blue Coat School, wanted to stand up for the female pupil and said she was "proud of him". She said: "I had no idea until I was sent pictures of what he had done. "But I am very proud of him for standing up for young girls that are probably already insecure. "I understand that the teacher had to send him home, because the girl had been sent home, but I don't think she should have been sent home in the first place. "Hugh Baird is meant to be for pupils who don't fit into other schools and they are allowed piercings and pink hair - so why not sports bras?" However a spokesman at Hugh Baird College said while the school does not have a uniform, pupils should "dress appropriately".